Here's a fun project we did together last year... yes, it's in the boys bathroom! And, read here for a fun DIY we did at Evan's 1st birthday party. Janelle from Isabella & Max Rooms, did this showcase for her little artists... read more here. 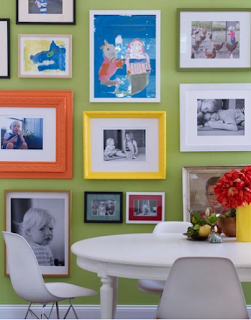 I hope to do something like this on a free wall in our familyroom or our basement (which we use just as often). And here her daughter (Isabella) took to canvas for artwork for thier upstairs landing, read it here. Isn't it great? Love it!!! Hope this ideas were helpful. Whatever you do, have fun doing it... the memories will be priceless! 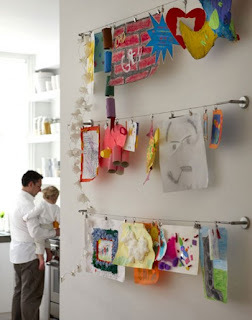 Great ideas , I like the way you made a post out of all this different styles of displaying childrens art. New Sponsor - Terra, Stella & Dot Stylist! Loving my new crystal lamps! Country Living at its best!! I'm in on the Nate Day Fun! 2010 - 1976 = 34 Today. Paper lanterns and bunting, take 2! 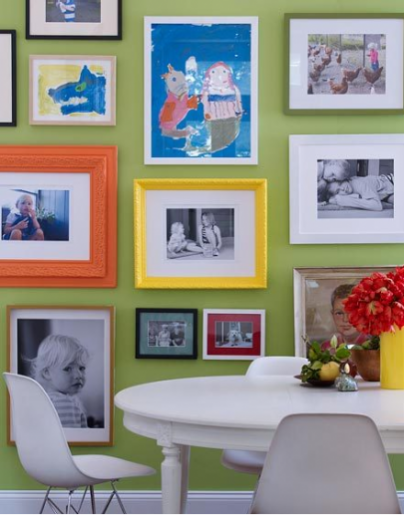 Sarah Richardson's Paint Collection - Love it!